Well, these weren't exactly scones. I'm not sure if there was a recipe misprint, but I knew something wasn't quite right when the dough finally came together. It was extra sticky, extra soft, a little too buttery for scone dough. There was also no kneading required, which is something I've always had to do when making scones previously. I assumed the dough just needed to be refrigerated, so I left it overnight. The next day, it had firmed up okay...but still needed a LOT of flour when rolling out. A LOT. Fast forward 15 minutes. I open the oven door to see the scones have spread like cookies! They even smelled like cookies! So these did not end up being scones, but a cross between a butter cookie and shortbread. Now aside from all my complaining and the "failed" recipe, these "scones" tasted amazing. The perfect balance of sweet and buttery (and they are oh so buttery), with just a hint of saltiness. Dried cranberries provide a surprising burst of tartness, and chopped pistachio pieces add a nice crunch and nuttiness. You get a soft, dense, moist cake-like texture with every bite...instead of the flaky, crumbly texture of true scones. Make again? Yes, with maybe some future recipe alterations. These would be great for breakfast with a side of savory veggie bacon or sausage. 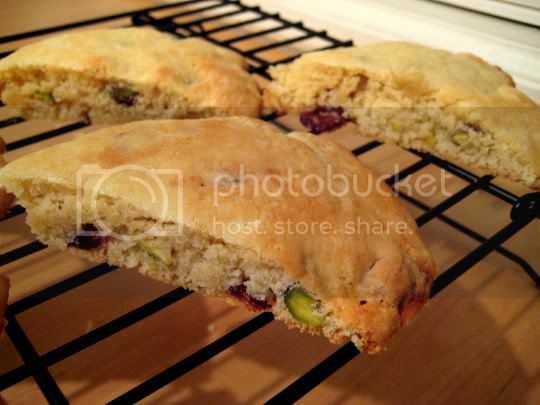 "Cranberry-Pistachio Scones," The Vegetarian Meat and Potatoes Cookbook, Robin Robertson. Boston: Harvard Common Press, 2002.